Mexican food is on a hot streak in Korea these days. Various new Mexican and Mexican-inspired joints are opening up all around Seoul while even Taco Bell is doing booming business with new stores opening up seemingly every few months. Being someone who lived in LA, good tacos is something that's certainly on my mind quite often. Whether it's a lazy Sunday afternoon and I'm craving some beer battered fish tacos or it's 2 AM after knocking back a few drinks and I'm drooling for a greasy chorizo taco stuffed with all the condiments from the sanitary-questionable salsa bar, a good taco is like memories of that first love you just can't forget. 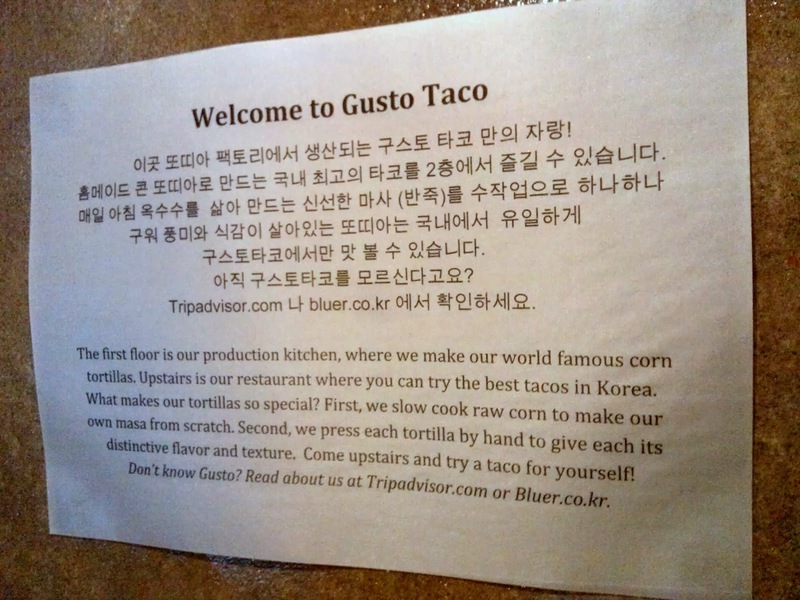 I first began hearing murmurs about Gusto Taco on various ex-pat food blogs and sites here in Korea a few months ago which began to steadily grow until I was hearing raves about it seemingly everywhere. I finally got the chance to hit it up recently. There's actually two locations in the Hongdae area, which reflects the business is doing well. In addition to a focus on quality ingredients, Gusto Taco's high point is their corn tortillas which are made fresh and in-house. At the store I went (the second branch) there's even a tortilla making station on the first floor where you can watch them create these corn tortillas. No store-bought, imported wheat tortillas used here. The branch I visited is the newer one and is quite spacious with lots of tables and a section that's used as a patio for nicer weather. Gusto Taco is another open kitchen restaurant so you can watch them warm up the tortillas, make your food, etc. It's a casual, order-and-pay-at-the-counter kind of spot with many of your standard Mexican-American faves. Whether you get the burrito, quesadilla, or tacos, your choice of fillings are: chipotle pork, pollo asado, vegetarian, tofu, and carne asada. The only exception is that there's a choice to get fish tacos made with grilled tilapia. Burritos go for 9,500 won and quesadillas go for 7,800 won except if you order it with carne asada in which case it's 10,500 won and 8,800 won, respectively. Taco orders gives you two tacos for 6,000 except the carne asada at 6,500 and tilapia at 7,500. Nachos run between 9,000 for just cheese only to 23,000 for the extra large with your choice of chipotle pork or pollo asado as the meat topping. Bottled Mexican beers, draft beers, soft drinks, and cocktails (margarita and pina colada) are also offered for thirst quenching. My friend and I went for an order of the carne asada tacos and a carne asada burrito. The restaurant wasn't full when we were there but it took a good amount of time for our food to get ready as everything was made to order. Taste-wise you could tell a lot of thought had gone into the taco creation here. The tortillas are soft but have just enough bite, the avocado cream and pico de gallo act as the pizzazz for the melted cheese and grilled meat and it all comes together beautifully. It is indeed the best tacos I've had so far in Korea. That being said, when getting into the nit-picky, the tacos here are a fine imitation but still a far cry from my beloved tacos of LA. For one, they're definitely not spicy and salty enough but more importantly the tacos here have too much of a "clean taste". The truth of the matter is that if you were to ask anyone in LA to take you to their favorite taco joint, no matter who you asked, their spot is bound to be a bit run down if not outright questionable status. I still dream about the random street taco joint my friend introduced me near the edge of K-Town; they grill everything (and I mean everything from chicken to cow parts) on a flat grill, serve all their delectable sauces in tupperware (which have been sitting out for who knows how long) and still is one of the cheapest yet damn delicious thing you can put in your mouth there. Just like how New Yorkers say there's something about their water that makes their bagels set apart from even the best bagel shops elsewhere, I don't know if it's because joints in Korea lack that bit of extra grease flavor or what, but it just doesn't have the "rugged" taste (a euphemism for that good ol' "dirty" taste) that really clinches the whole deal like the tacos in the city of Angels. But yes, that's like asking for the A+ with a still exceptional A grade and the tacos at Gusto Taco are nonetheless fantastic if not a bit pricey and small to hold you over till the next meal alone. I wish I was as impressed with the burritos at Gusto Taco but these boys definitely don't make the cut for best burritos in Korea (that title is begrudgingly given so far to the California burrito of the Korean Chipotle knock-off, Tomatillos). I definitely didn't see much beef in there which left it essentially a tortilla wrap of rice and beans. Unlike the tacos, the cheese here seemed to be melted nacho cheese which, if you think about it, paying 10,500 won for mostly rice, beans, and nacho cheese is a little outrageous, no? For that price, more greens, more pico de gallo (again, almost non existent), a bit of sour cream, real cheese- and most importantly- more beef should surely be included in the mix. The burrito wasn't even very flavorful at that as I liberally doused mine with the hot sauce. Skip the burritos here. Their house-made sauce was sure tasty though. You can see the real bits of pepper and other goods that are mashed and blended inside. Make sure to grab a bottle for your food from the counter section! In conclusion, yes, it's the best tacos in Korea I've had. No, it's not as good as the real deal but that may never be achieved anywhere outside SoCal, the South, and Mexico itself. And no, don't get the burritos. The atmosphere is chill and laidback, perfect for friends or a casual date meal. It's a little pricey for the portions but it's definitely where I'd say you should go to get your Mex-craving taco fix (aside from making your own at home). I'm not sure though that Gusto Taco's clear winning status in their tacos warrants a trek to their place if you're not in the area. Though their tacos are fantastic, there's a number of Mexican joints in Noksapyeong/Itaewon and such which serves perfectly fine tacos, although not as good as Gusto Tacos. But aside from winning the taco taste test, there's no other clear advantage I see in Gusto Taco whether its their burritos (can't say about the quesadillas or nacho since I haven't had it), their price, portions, etc. But if you're a taco lover in Korea and you're in the neighborhood, by all means, give these tacos a go and it will certainly bring back a whiff of nostalgia from your favorite taco joint at home. The tacos are the best here but the burritos are average, at best. It has a good atmosphere with plenty of seats. Prices are a tad high and portions are so-so, so you may end up shelling out more to be full than you might pay for an average meal. Tip: The Sangsu branch has a nice patio to enjoy some sun and people watch when the weather's nice! Also, they do fresh guacamole here too for fans of the guac.